needs to make its way on to your Thanksgiving Brunch menu! I mean whats not to love about eating cake for breakfast. I am not talking about just any cake I am talking about a coffee cake with subtle pumpkin flavor, and ribbons of cinnamon and brown sugar! You know this coffee cake has to be good when I tell you that this particular coffee cake won the seal of approval from my pickiest critics! Now thats saying something! So at this time I am going to stop talking and share the recipe with you! Enjoy! Pre Heat your oven to 350 degrees and grease a bundt pan with cooking spray. Combine your first 3 ingredients and set aside. In a mixing bowl combine sugar and butter. Beat with a mixer until well blended. Now add your egg and beat for 3 minutes. Add in your yogurt, pumpkin and vanilla and beat until incorporated. In a separate bowl combine flour, baking powder, and baking soda. Whisk together and make a well in center of the mixture. Now add your sour cream mixture to the dry ingredients. Stir just until combined. Now grab your brown sugar mixture you combined earlier. Set aside 3 tablespoons in a separate bowl. .Sprinkle the remaining brown sugar mixture over the batter. Gently fold the batter 4 times. Pour batter into your greased bundt pan, and sprinkle with the remaining 3 tablespoons of brown sugar. Bake for 30-40 minutes or until a tooth pick inserted in the middle comes out clean. Let your cake cool completely before turning out onto a serving plate. 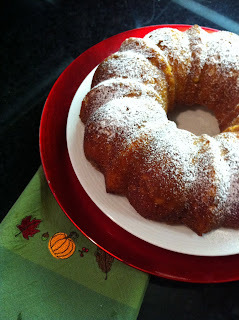 If you wish to glaze your coffee cake combine your powdered sugar and juice in a small bowl. Stir until smooth and drizzle over the top of your cooled coffee cake! You're blog is turning me into a copy cat, I definitely am making this over the holidays!! It looks so tasty! I seriously think I am going to eat my weight in food this week. Recipes galore...this looks lovely! That looks amazing and I love your blog! Thank you for stopping by at Miss Dixie! mmmmmm... 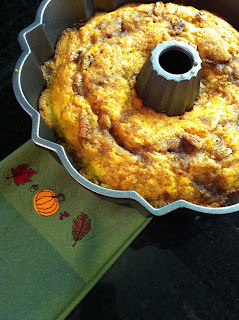 I love coffee cakes, and a pumpkin one sounds Hevenly! Thanks for visiting Yummy Mummy, I'm happily your newest follower. Happy Thanksgiving! enjoy the holiday and have an amazing Thanksgiving!!! yum yum yum!!! Have a wonderful Thanksgiving! 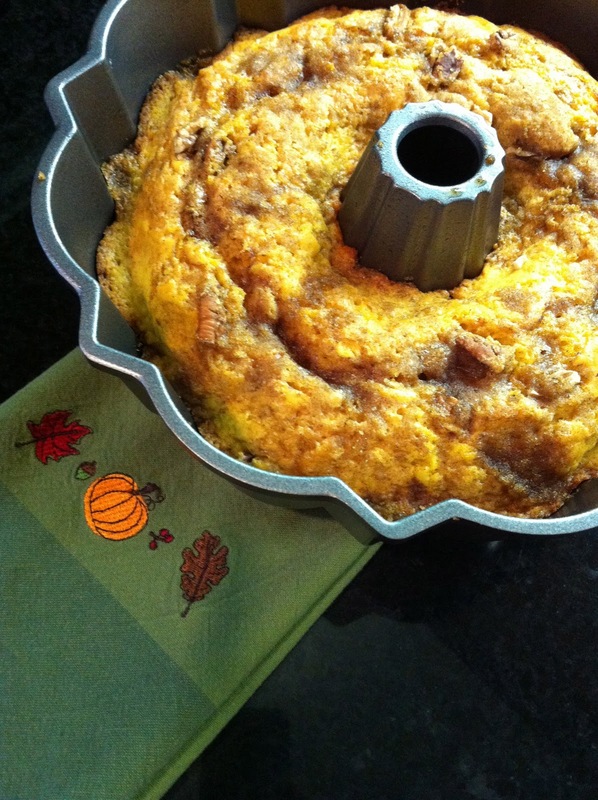 OMG - this looks delicious, it will be a great dessert to have for Thanksgiving, thanks for sharing! Have a great one! Mmmm--I love coffee cake! I also love pound and angel food cakes for breakfast every now and then! oh how I would love to wake up to this today!